Edelbrock E-Force Supercharger systems deliver excellent horsepower and torque in a complete kit. Featuring a unique design with minimal components. It makes it possible to fit an E-Force Supercharger under the stock hood. The core of each system is the Eaton Gen VI 2300 or 1320 TVS® Supercharger rotating assembly with a four lobe design with 160° of twist for maximum flow, minimum temperature rise and quiet operation for excellent drivability. We also designed our superchargers with an integrated bypass valve to help eliminate parasitic loss under light throttle, improving mileage potential. Our unique and efficient inlet configuration results in a shorter, less restrictive intake path for improved air flow, without the need for a jack-shaft. Keeping the air cool is a high capacity air to water intercooler and low temp heat exchanger. Edelbrock supercharger systems are available in three performance levels for most applications. These systems are emissions legal and provide the best combination for your daily driver. They will also include a tune for both 91 and 93 octane, on select applications. The supplied tune is intended for completely STOCK vehicles with the exception of a cat-back exhaust. These systems include the components from the Stage 1 system with the addition of a cold air intake (if required), smaller pulley, fuel injectors (if required), fuel pump (if required) and a custom tune, giving you great performance for the track. These systems are for competition racing only (except for our Corvette systems, which are emissions legal) and are available as a complete kit or as an upgrade. The supplied tune is intended for completely STOCK vehicles with the exception of a cat-back exhaust. Our Professional Tuner systems include all of the essential components that a racer would need to build a custom supercharged racing setup. They offer flexibility in pulley selection, cold air intake and more. These systems are for competition racing use only. Finally... the Edelbrock E-Force Supercharger system is not just a performance upgrade, it also has great looks! The supercharger assembly and aluminum coil covers (on most applications) are powder coated for durability and provide a unique appearance that will give any engine compartment a custom look. 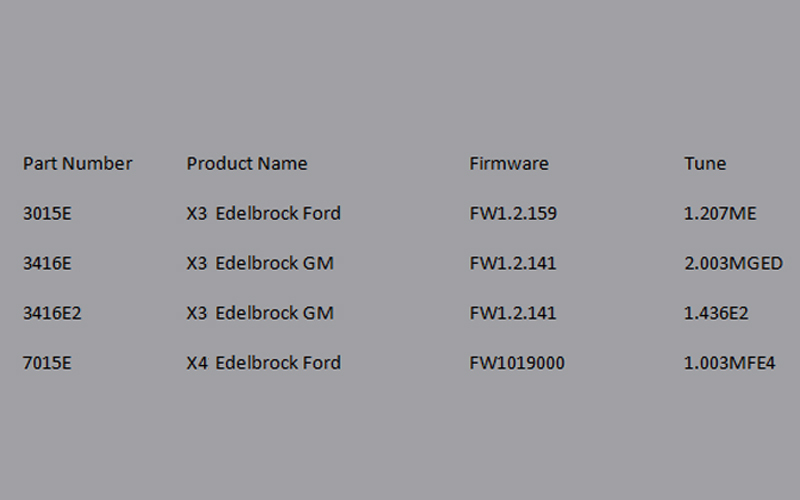 Some Ford programmers must be updated using the "Automatically Check for Updates" button in the SCT Device Updater. ALL GM programmers must be updated using the "Automatically Check for Updates" button in the SCT Device Updater.